Programmatic guaranteed is expected to drive efficiency improvements of 50% for publishers and almost 30% for advertiser and agency buying teams, according to a study produced by Boston Consulting Group (A Guaranteed Opportunity in Programmatic Advertising). Moreover, budgets are shifting towards programmatic buying. Additionally, advertisers’ budgets are growing and demand for programmatic premium is continuously increasing. In 2019, the US will spend over $22.5 billion on programmatic direct setups*. Publishers, it’s turn to seize the opportunity, with programmatic guaranteed! 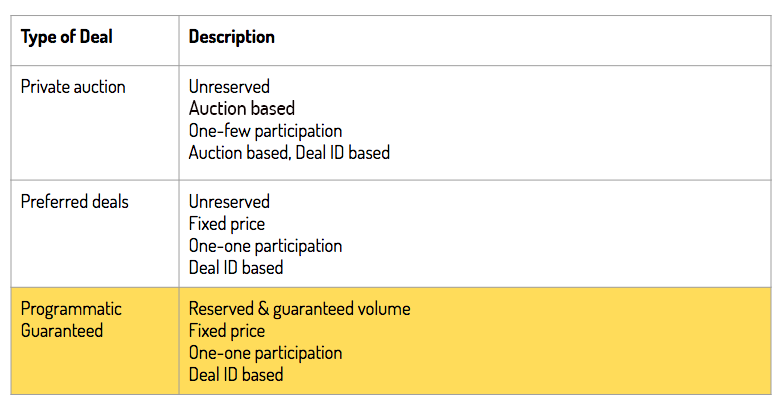 It’s important not to confuse Programmatic Guaranteed with private auctions and preferred deals. Check out this chart for definitions of each. Programmatic Guaranteed deals are programmatic deals based on a guaranteed volume of impressions at a fixed price, that you can execute on all environnements (rich media, web, video, mobile, in-app). These deals are taken into account by our forecasting engine to ensure 100% delivery of the guaranteed volume of impressions. Since the guaranteed impressions are based upon a forecast, you’ll need to be a full stack customer to benefit from this feature. Increase your revenue: attract buyers who are looking to execute high volumes of guaranteed deals. Secure opportunities: Programmatic ad sales oftentimes means a lax commitment with buyers. Commitment is set in stone. Agree on a price and receive 100% commitment from buyers on a reserved volume of deals.